You'd think that by this point, Final Fantasy XIII producer Yoshinori Kitase would have gotten tired of answering questions about a potential Final Fantasy VII remake, but that doesn't appear to be the case. When he's not talking about the upcoming Final Fantasy XIII, producer Yoshinori Kitase - longtime JRPG veteran who directed beloved titles like Final Fantasy VI and Chrono Trigger - has frequently shared his opinions about the oft-asked-for current-gen remake of Final Fantasy VII. But is Kitase as tired of being asked about the hypothetical FF7 remake as most of us are of reading about him being asked about it? Guess not: "I don't get tired of people asking that question, so I will continue to answer my thoughts at that time as long as people keep asking," Kitase told Gametrailers. 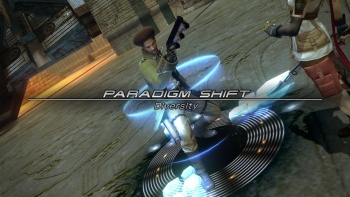 The series veteran went on to clarify remarks he made earlier this month about the difficulties involved in a remake of the legendary JRPG, where he'd claimed that it was "very hard to make games on PlayStation 3 in the same style as the games in that era had. Making graphics will take enormous time." "For Final Fantasy VII of course it was released for the [Playstation 1]," said Kitase. "The animation was a lot more simple and there was no voice acting involved at all ... So as the hardware develops there's so much more that can be done for the game. Visual capabilities are up. The quality is so high right now. So in a sense I'm really interested to see this more complete form of a Final Fantasy VII portrayed more realistically with the voice and animation and all the subtle expressions there." "I would be interested to see that and to make that would be a great experience." Essentially, Kitase's answer isn't much different from his earlier remarks - it was simpler to make games back in 1997, it's much harder to do them now - but there's a much more optimistic spin on the idea now. So yes, FF7 fanboys, here's some more false hope for a remake of one of the most crazily-hyped games of all time that you can cling to until the remake is actually announced. Or until the heat death of the universe. Whichever comes first.